There is no doubt that polished concrete floors are highly durable, strong and long-lasting. They can withstand intense pressure in comparison to other flooring alternatives. With a lower lifetime cost, concrete floors can last for years if maintained properly. Restaurants, manufacturing facilities, hospitals and outdoor entertainment spaces have heavy machines and equipment that can damage flooring. Industrial and commercial spaces like these; are usually high traffic areas and floor durability can greatly benefit them. Hotels, restaurants and huge retail stores aim to impress their customers at first glance. Beautiful and decorative flooring can greatly enhance the ambiance of a place. An appealing and striking visual appearance will automatically attract customers. Concrete flooring is a low-cost alternative to vinyl tile, carpet and wooden flooring. It is highly customizable and can be made to fit the look of the place. Moreover, polished concrete floors can add a touch of sophistication and magnificence to the space and communicate elegance and style. Polished floors can also brighten up and illuminate a space as they reflect light extensively. High-traffic areas are more prone to stains, especially in commercial and industrial spaces. Places like meat packing factories, bakeries and restaurants tend to have a greater amount of spills. Superior quality concrete floors will resist spills and stains and will be easier to clean, reducing the maintenance cost of the flooring substantially. Furthermore, concrete floors are ideal for places like hospitals and restaurants that require a sterile and sanitary environment and use harsh cleaning chemicals to clean their floors. Concrete is strong and is resistant to harsh chemicals. In addition to that, concrete flooring is also slip resistant. This will reduce the amount of accidents and injuries to customers and staff in high traffic commercial spaces like restaurants and retail outlets. Concrete has a unique “thermal mass” property. This means that concrete is capable of slowly absorbing, storing and then releasing heat or coolness to its surroundings. This property can be used by commercial spaces to moderate their indoor temperatures. Energy bills can be greatly reduced with concrete floors as they can reduce the load on air conditioners and heaters. With exposed concrete flooring, you can now turn down the settings on your cooling or heating system and save money on your energy bills. Concrete flooring is an ideal alternative to other flooring options. 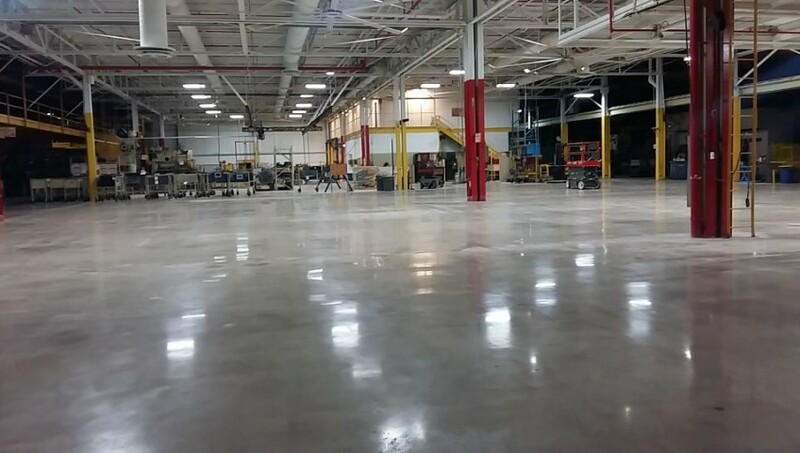 The benefits of concrete flooring are numerous and will allow you to save money and enhance the visual appeal of your commercial or industrial space as well. They are a sustainable and eco-friendly flooring option that will last you for years after installation. So, make an economical and environment-friendly choice by choosing concrete flooring for your commercial or industrial space. No doubt, the concrete flooring installation can do wonders with both commercial and industrial floors. Is they are equally beneficial as epoxy floors? Please explain.